A lot of Nordic type dogs crossed with breeds such as the German Shepherd are often mistaken as wolfdogs, but actually have no wolf in them. 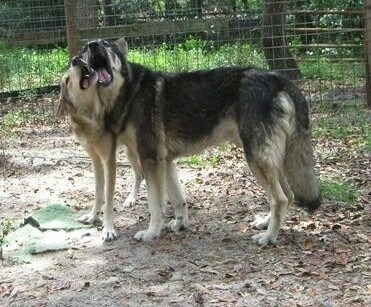 Another popular cross often mistaken for a wolfdog is the Alaskan Malamute mixed with a Husky (Alusky). This section shows examples of non-wolfdogs that are often mistaken as part wolf. If you look carefully at the dogs, comparing them to the dogs pictured on the wolfdog page and then study some of the pictures of the Nordic dog types you will begin to pick up on the differences in appearance. It is important that people learn the difference. 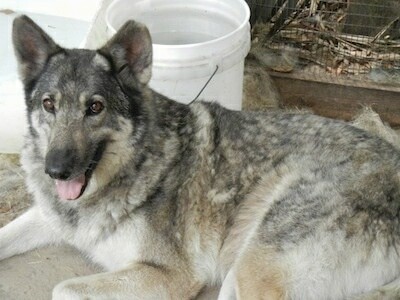 There are many dogs in shelters that are killed because they look like wolves when they are actually Nordic type dogs, such as Husky or Malamute mixes. 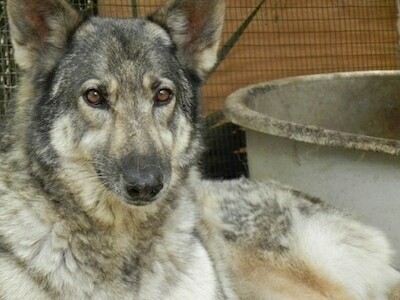 Falsely labeling animals as wolfdogs in shelters can be detrimental. Nordic dogs are being killed and wolfdogs are not going to the proper rescues where there are people who know how to deal with them. 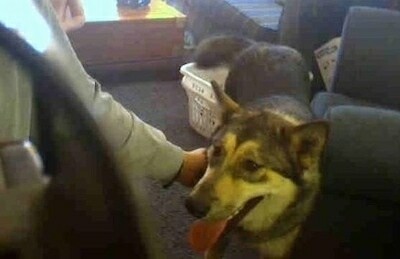 If you own a dog that is often mistaken as part wolf and would like to share, send in a picture(s). 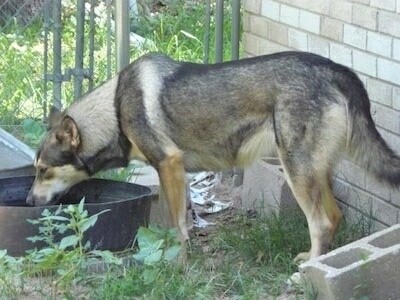 Shiloh is a very timid German Shepherd mix that spent approximately 6 months chained outside. When the owners no longer wanted him they turned him loose and he spent months on the street. When he was finally caught and impounded by animal control he was emaciated and flea infested. 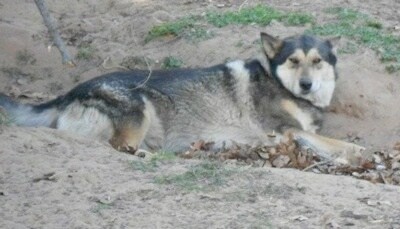 However, he looked part wolf in the eyes of animal control and employees were too afraid to interact with Shiloh. In fact Shiloh was more afraid of them in reality. 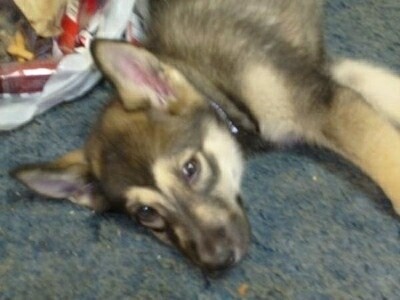 Shiloh does NOT have any wolf content and is mostly GSD. His fearfulness can be attributed to the neglect he suffered but if you take the proper time Shiloh will slowly gain trust in you. 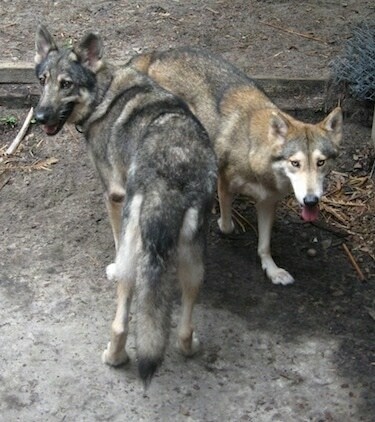 He is very happy with his female companion Ellie who is a mid-content wolfdog. Both Shiloh and Ellie are fixed. "Meet my brat Cheyenne, shown here at 3 years old in her summer coat. 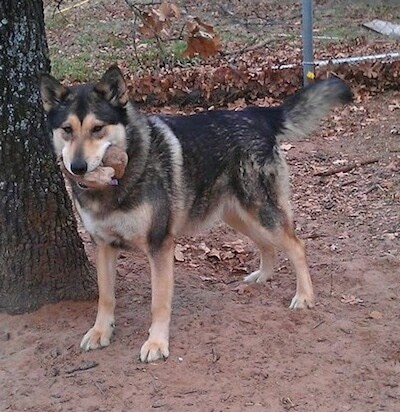 Chey is a German Shepherd / Malamute mix that is frequently confused as having wolf content. I have yet to show someone a picture of her who does not ask if she is wolf or part wolf. Chey has no wolf; she just looks like she might. Cheyenne is currently 5 years old and the biggest, most spoiled baby ever. She still thinks she should spend all of her time in my lap even though she is far too big for that these days. Cheyenne was sold to me when she was 3 weeks old by a ’breeder’ that told me she was full blood. Her mother, father and grandmother were all on site and although I never believed she was full, I didn't realize what I was looking at when looking at her father and grandmother and believed her to be half. I had Cheyenne phenotyped when she was 3, only to find out that she has no wolf content in her. Had I done my research before I bought her, I wouldn't have been fooled. I don't regret getting fooled though; if not for that ‘breeder’ I wouldn't have Chey and I wouldn't have learned so much about wolfdogs." 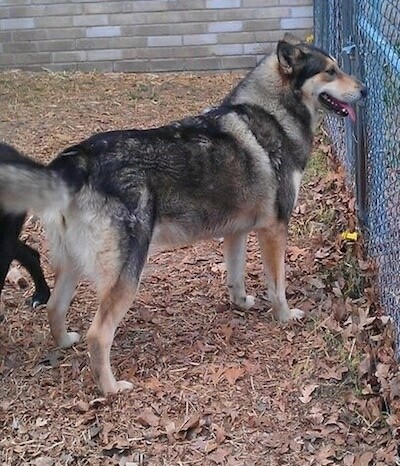 "This is my GSD / Malamute (or Husky) mix, Yazhi. He was sold to me as a low/mid content wolfdog. I had him phenotyped later and found out that he has no wolf in him, which was quite all right because I still love my baby boy! He is very sweet but a little shy with new people. 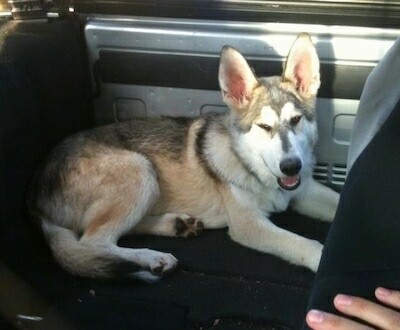 Everywhere we go, people ask me (and sometimes argue with me) if he has wolf in him. I tell them no and explain the ways they can tell for future reference." "I got Snow at 6 weeks old. 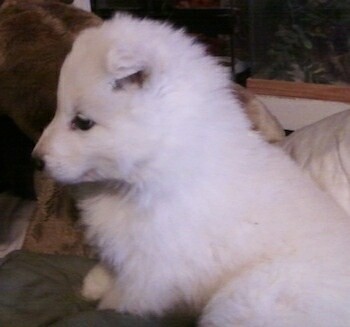 She was a pure white fluff ball and reminded everyone of a little polar bear at that age. 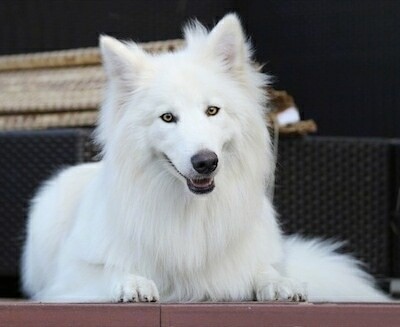 I was told she was 97% Arctic wolf and had I done my research and educated myself beforehand, three things right off the bat would've told me she was not. 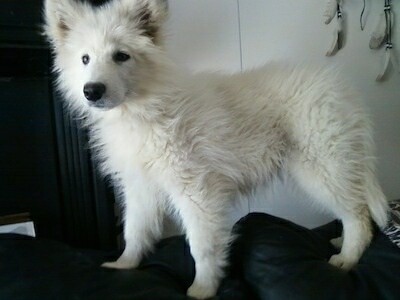 She was born pure white and was pure white at 6 weeks, and I learned even Arctic wolf pups do not phase out white until a couple months old. 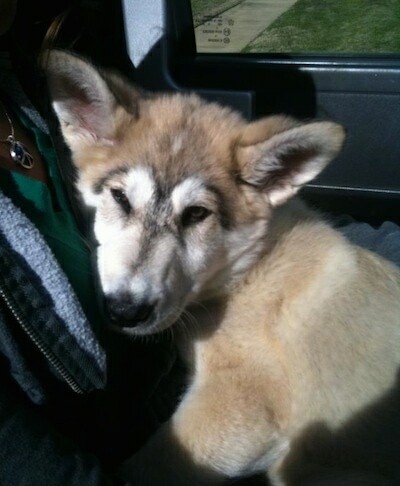 She was born during an off season of breeding for wolves and wolfdogs of that content. I learned they should be born ONLY during spring. And I was told a percentage of 97. Had I learned sooner, I would've realized you cannot pin an exact percent on a wolfdog; you can only tell how much wolf is in them through content: low, mid, and high. So as I learned, I came to find out Snow had absolutely no wolf in her. She has such wolfy features like a lack of stop, narrow chest, and walks in-line, however, breeds such as the German Shepherd can also display such traits. Still, to this day, I do not know exactly what Snow is. 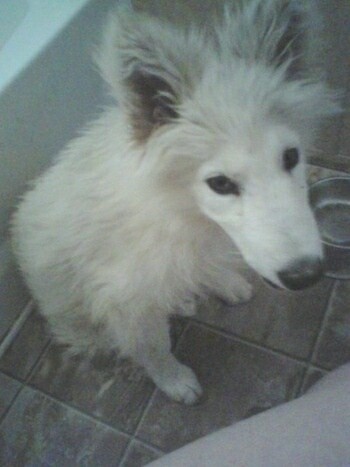 She could be a Samoyed, Malamute, Great Pyreneese, GSD, Husky mix or something along those lines. I may never find out for sure what she is, but never do I regret my mistake. She is unbelievably smart and willing to please and very loving. I found very quickly I would not have preferred to have her than a high-content ‘97%’ wolfdog anyway, at this point in life—I am just NOT ready for one. She has been a blessing to cross my path and I feel VERY lucky for making the mistake I did, but it is because of her that I finally learned about wolfdogs and got to dip my feet in the water with a Nordic breed mixed dog before going into the ocean with a true wolfdog. 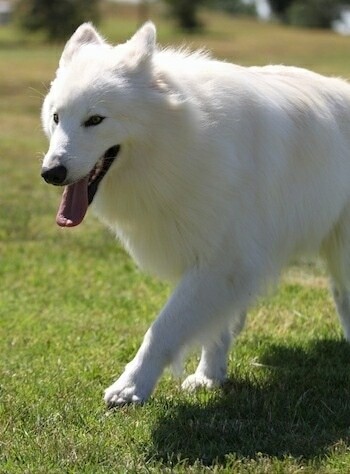 "—Some believe Snow is a long-haired White Swiss Shepherd aka Berger Blanc Suisse.